February 19, 2015 -- Steve Torrence is understandably anxious to get his Capco Contractors dragster back on the high-traction concrete-and-asphalt surface at Wild Horse Pass Motorsports Park where he will pursue the Top Fuel championship in this week’s 31st running of the CARQUEST Auto Parts Nationals. After all, the talented Texan has reached the semifinals in three of his five appearances at the track in the desert and last year he covered the 1,000 foot distance in an impressive 3.758 seconds while qualifying third. At the time, it was the second quickest run of his pro career. Even now, it’s his third best. 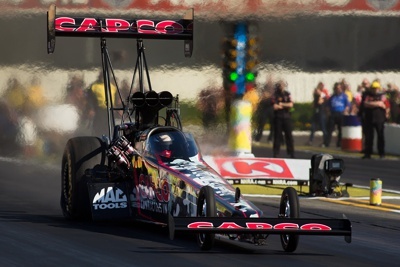 Furthermore, while his overall Top Fuel record is only 96-112, he is 7-4 at Phoenix. At only one other track does he have a better winning percentage in his career (he is 6-3 at Atlanta Dragway). Nevertheless, for all his success at Wild Horse Pass, Torrence has not been able to close the deal and therein lies the rub. His resume for the event mirrors his resume over the last 20 months – close, but no trips to the winners’ circle. That easily could change this weekend. “We’ve been working on some things that we’ve wanted to try before,” said the former Top Alcohol Dragster World Champion (2005). “This year’s (pre-season) test session in West Palm was probably the most successful we’ve ever had and Pomona (the season-opening Circle K Winternationals) did nothing to discourage us at all. A four-time Top Fuel winner on the NHRA Mello Yello tour, Torrence knows his Richard Hogan-led team was just a couple of good breaks away from finishing second to Tony Schumacher in last year’s point chase. A cancer survivor whose passion for racing is equaled only by his passion for the outdoors, Torrence credits Hogan and a team that returns largely intact for putting him in position to become the first driver ever to win NHRA championships in both the Top Fuel and Top Alcohol divisions.